Understanding the basic mechanisms that govern materials failure still represents a major challenge. It involves the material structure at small time and length scales through plastic deformation and damage, release of fluctuating elastic waves, and chemical processes. Understanding these phenomena calls for time-resolved observations and measurements of the fracture events at an atomic scale. 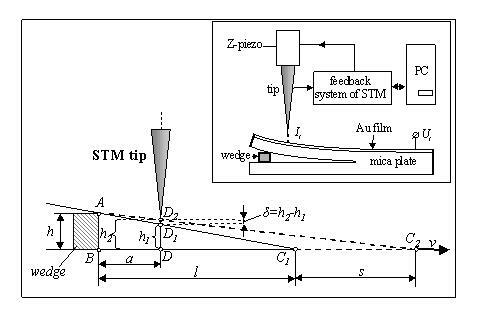 We describe here how the feedback system of a conventional scanning tunnelling microscope (STM) can be used to probe fracture events at the nanoscale for moderate loads and crack growth rates (see Figure 1). The time dependence of the crack growth rate, or more precisely the crack tip velocity averaged over a time window of width Δt=1/f, where f refers to the scanning frequency, can then be measured accurately. Time dependence of the vertical displacements Δt induced by a crack propagating in a mica sample placed in air (top) and in n-tetradecane (bottom). We applied this novel technique to observe fracture events in mica single crystals. 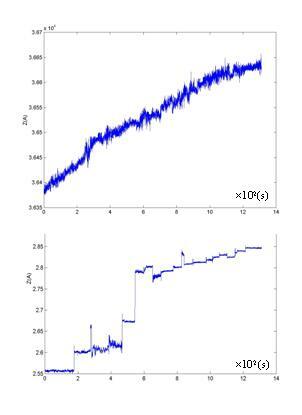 When the crack propagates in a liquid (here we used n-tetradecane), the velocity distribution obeys a power law, but follows an exponential onewhen performed in humid air (see Figure 2). Two alternative explanations were proposed to account for the intermittent behaviour in absence of humidity: (i) The large scale velocity fluctuations are the signature of avalanches occurring when parts of the front depin from heterogeneities within the fracture plane or (ii) drastic changes in the mechanical properties of n-tetradecane due to confinement. Reference: A. Marchenko, D. Fichou, D. Bonamy, E. Bouchaud, Appl. Phys. Lett 89, 093124 (2006).